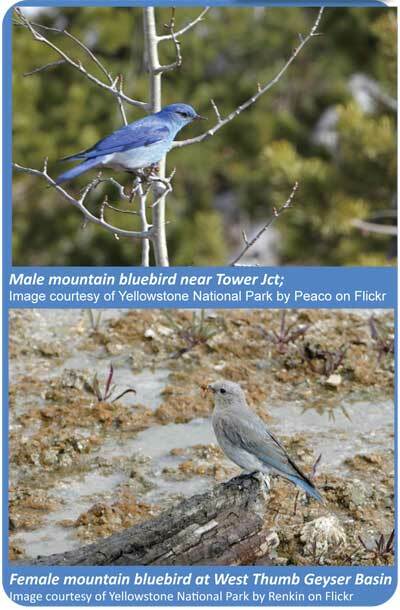 It is likely that you saw a female Mountain Bluebird. But yes, feathers can fade during the summer. I know my young magpies have an almost gray head, which they will molt before fall. Most small birds have now molted into a fresh plumage in preparation for migration. Pigmentation: Pigments are colored substances that can be found in both plants and animals. Many colors in bird feathers come from a combination of three pigments. Melanins are responsible for blacks and dark colors, while carotenoids produce yellow and red. Porphyrins produce a range of colors, including pink, browns, reds, and greens. Melanins and phrophyrins are made by the bird’s body, but carotenoids are obtained from the diet. That’s why a flamingo’s colors fade when it doesn’t have the right diet. Structural Colors: Iridescent colors in birds are seen only when light strikes feathers at certain angles. These colors are created by prism-like structures in the feathers, rather than color pigments. Iridescent colors are found on hummingbirds and magpies, for example. Not all structural colors are iridescent. Tiny air pockets in the barbs of feathers can scatter incoming light, resulting in a specific, non-iridescent color. Blue colors in feathers are almost always produced in this manner. Both: Feathers may have both pigments and structures that create colors. Ultraviolet Feathers: The feather structures of many species of birds also reflect light in the ultraviolet range. Because many birds can discriminate a greater variety of colors than humans, including ultraviolet wavelengths, they can appear quite different to each other than they do to us. The sun’s energy is made up of three distinct parts – UV, visible, and infrared radiation. There are parts of the feather called chromophores. Over time, the energy from ultraviolet light breaks down the bonds that form these chromophores, resulting in less light of the chromophore color being reflected. To our eye the object looks less vibrant or faded. Collect the objects you will use. Outside, find an area that is in direct sunlight. Put your construction paper on the ground. 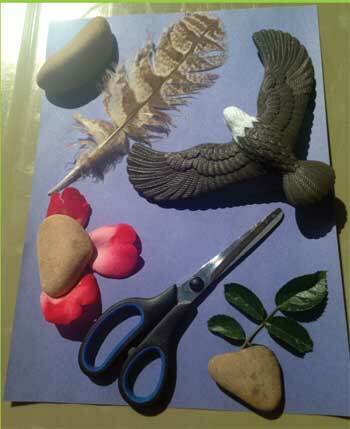 Arrange the objects in interesting patterns and shapes. Leave in the direct sunlight for several hours. Observe the color of the construction paper. Is it the same color as before? Remove the objects from the paper and observe what happened. The UV light from the sun faded the paper around the objects. ← Why does touching the canvas of a tent during a rain storm make the tent leak?